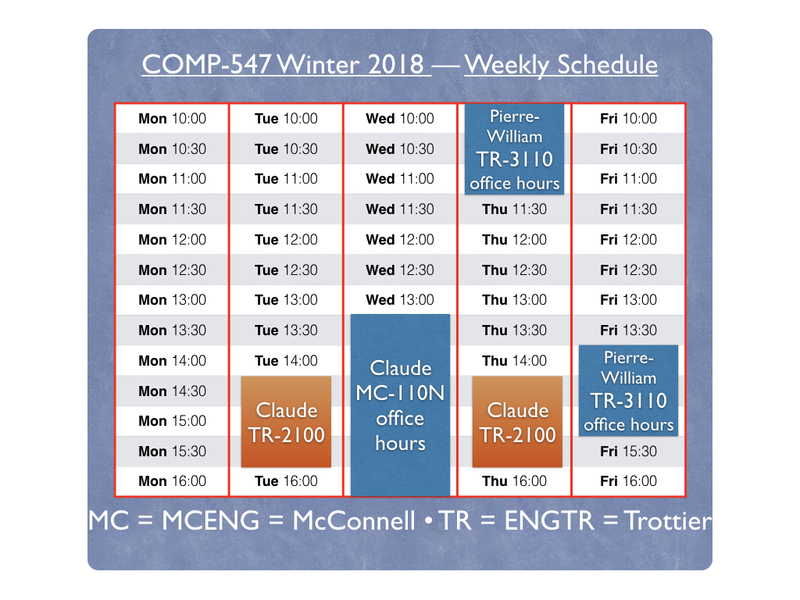 Claude : Wednesday 13:30-16:30, McConnell 110N. Pierre-William : Thursday 10:00-11:30, Friday 14:00-15:30, Trottier 3110. INFO: -- Discrete Log record ! FINAL EXAM 1999 Ignore Q5. FINAL EXAM 2000 Ignore Q2. FINAL EXAM 2005 Ignore Q5 (b) & Q6. FINAL EXAM 2006 Ignore Q1, Q5 & Q6. FINAL EXAM 2007 Ignore Q1 & Q5. FINAL EXAM 2008 Ignore Q2. FINAL EXAM 2010 Ignore Q4. FINAL EXAM 2011 Ignore Q5 iv). FINAL EXAM 2013 Ignore Q6. Description: (4 credits, 3 hours). 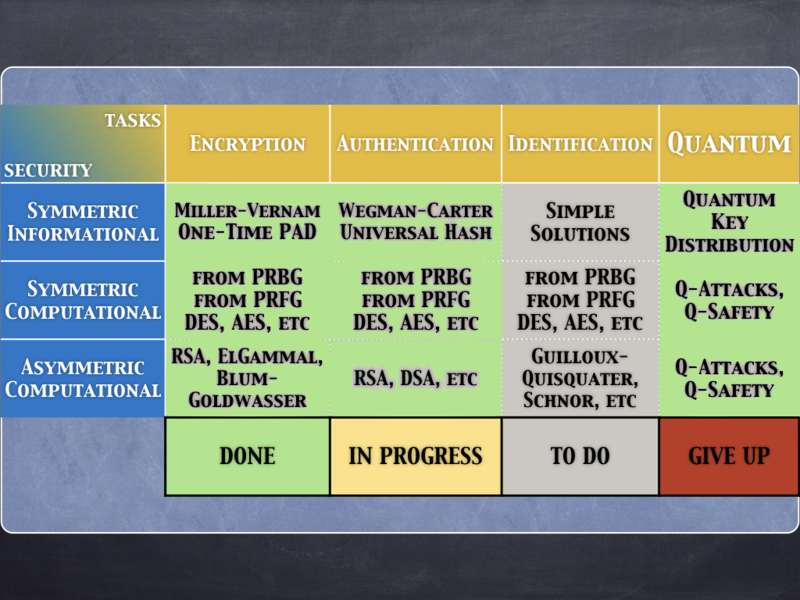 This course presents an in-depth study of modern cryptography and data security. We investigate four important subjects of cryptography: data encryption, message authentication, user identification and key distribution. 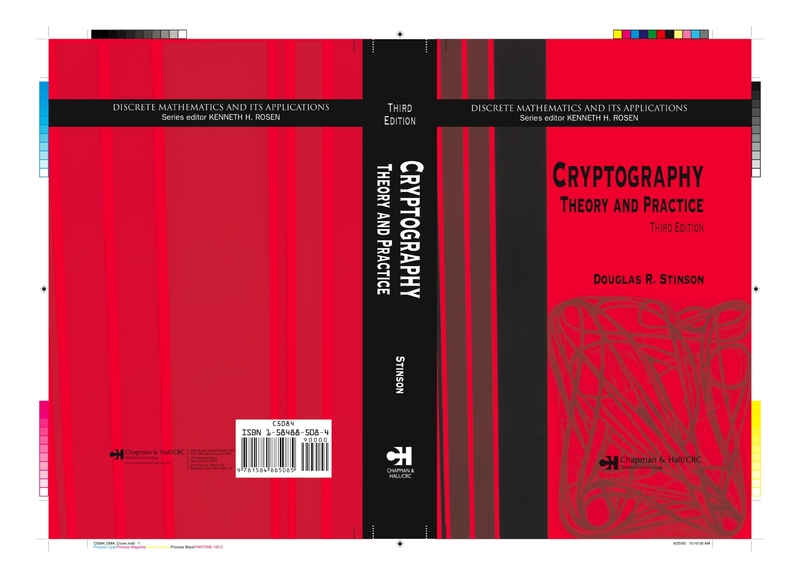 The basic information theoretic and computational security of classical and modern cryptographic systems are analysed. The course is self-contained and all necessary mathematical background will be explicitely covered. 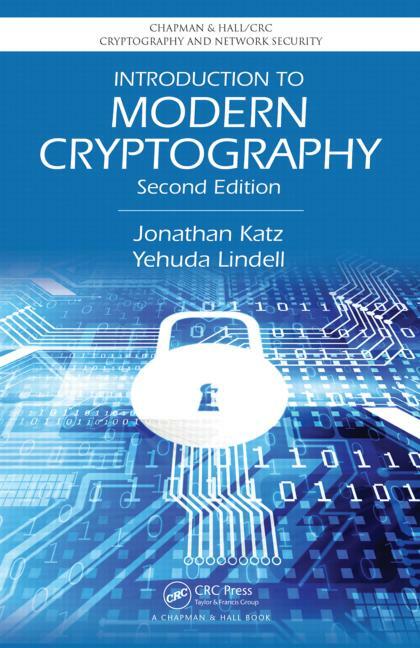 Introduction to Modern Cryptography 2nd Edition , by Jonathan Katz and Yehuda Lindell. Publisher: Chapman and Hall/CRC Press, Nov 2014. Available labs with maple 16 installed : lab2-X, open-X, lab6-X, lab7-X, lab9-X, where X is from 1 to approximately 25. Any student taking a cs course either has or can create a CS account. 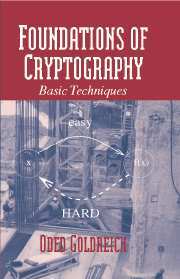 Foundations of Cryptography: Basic Tools. 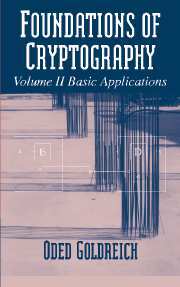 Foundations of Cryptography: Basic Applications.